I’ve been reading DC’s Dark Nights: Metal with one eyebrow perpetually raised; something about the concept of the event and its aesthetics just weren’t clicking into place for me. But then I talked to a friend, who told me that the key to Metal was understanding that DC’s been in the process of deconstructing the idea of Batman—those parts of Batman that aren’t just dark and moody, but are legitimately destructive and unhealthy. At this year’s New York Comic Con, I got a chance to discuss this idea with Metal writer Scott Snyder himself and he explained that beneath its outlandish, Kirby-esque surface, Metal really is an exploration of Batman’s interiority that we seldom see. Metal’s squad of evil, alternate universe Batmen aren’t just villains, Snyder says in the interview that follows; they’re manifestations of the all-too human fears and anxieties that Bruce Wayne harbors within himself, the way we all do. io9: We’ve got to talk about these Dark Knights of yours. They all look and sound fantastic, but they also sort of feel like Big Bads dreamed up specifically for Metal. What were you going for in creating them? Snyder: There’s the commercial idea that these are all a bunch of evil Batmen and of course that’s cool, but that was never really the big part of the discussion of why we’ve introduced them. What they really stand for is something more, something more about Metal. Snyder: Metal is really a story about moments—moments that I’ve gone through myself—where a person is struggling with depression, anxiety. In those moments, you wake up and feel like every version of yourself that you can see going forward is ugly and failed. All your worst fears about yourself become manifest in your own mind. It’s almost like a voice telling you that the person you’re going to be tomorrow is a worse and worse version of the person you are today. io9: So, the Dark Knights are Batman’s internalized fears? Snyder: The Merciless, the Wonder Woman analogue, it’s Batman’s fear that if he waged war on crime the way that people want him to—the way that Wonder Woman does in a sense that it’s a total war—he would ultimately win it. But he would win in a way that would force him to lose his humanity. It’s the opposite of the way he actually fights crime—with his code—which is as much about letting him maintain his humanity as keeping other people safe. io9: We’ve talked about the Batman Who Laughs, the version of Bruce who becomes infected with Joker Toxin, which also stems from his fear of becoming a killer. What other pieces of Bruce’s psyche are you unpacking here? Snyder: Take the Dawnbreaker, the Green Lantern Batman. That character’s a manifestation of the fear that he’s ultimately too attached to the death of his parents—and should he have had the chance, he would have tried to bring them back using Lantern technology that would have culminated in the end of the world. 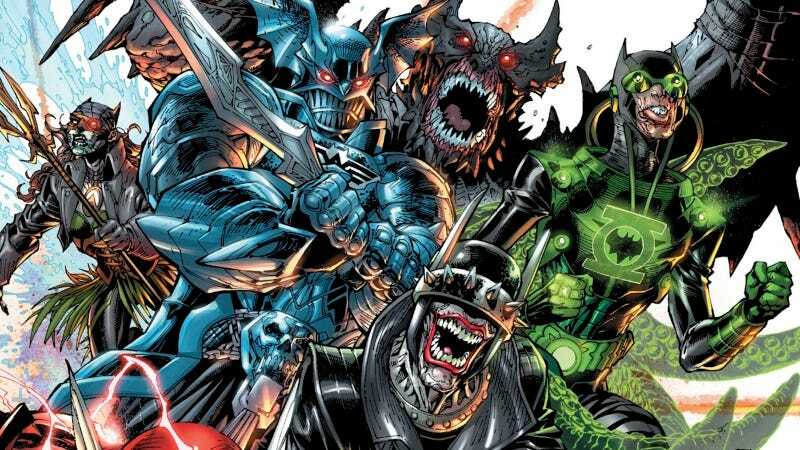 io9: Each of the Dark Knights have different origin stories involving Bruce murdering another member of the Justice League they’re modeled after. But not each of them is directly tied to Bruce’s fear of becoming a killer, are they? Snyder: We wanted to come at each of the Dark Knights a bit differently, and some of them, like Devastator, the Superman one, originally come from a more positive space. The Devastator is Bruce’s fear that he’s been crippled by his friendships with other heroes. io9: Because he feels they make him weak? Snyder: And that he should instead be tougher on his own. Devastator’s literally from a universe where Superman’s been taken over by something and he devastates the world. Batman, his friend, feels as if he hasn’t made the right preparations, and the Devastator is Bruce’s plan to infect himself with the Doomsday virus so that he could never be caught physically vulnerable again. Every single one of them is meant to be an emotional extension of his own fears about himself—his own worries that he’s not the hero he thinks he is or should be. That’s the part about these characters and this story that I’m hoping people are resonating with. If you’ve struggled with dark moments, everything you’re proud of about yourself, everything you’ve achieved, is suddenly flipped. You think to yourself that none of those matter. All that matters are your flaws. You’re a collection of your worst aspects.